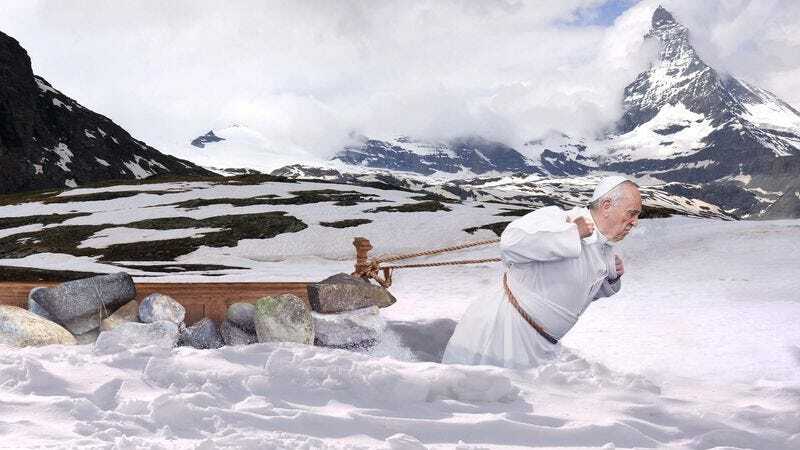 AOSTA, ITALY—Pushing himself to the physical brink in the bitter cold wilderness high in the Alps, Pope Francis reportedly began training Friday for this year’s upcoming Easter Mass by dragging a wooden pew loaded with rocks across the snow. “No stopping now; the weak never finish,” said the sweat-drenched bishop of Rome, pausing briefly to splash his face with holy water before continuing the workout by trudging through waist-high snow while shouldering a heavy wooden crucifix. “Come on— focus, Jorge. You gotta keep fighting. You can withstand the pain and fatigue. Your body, mind, and soul are getting stronger. Just a few more days until the Resurrection. All this work’s going to pay off when you’re up there on that balcony at St. Peter’s.” At press time, sources confirmed His Holiness had switched to an uptempo song on the mix of Easter hymns playing through his earbuds and began speed training by bobbing and weaving around a swinging thurible.